When he wasn’t puzzling the mystery of alien civilizations, Enrico Fermi was splitting atoms. He realized that when atoms were split, the neutrons released could go on and split other atoms, creating a chain reaction – and the most powerful weapons ever devised. Discovered “by accident” by NASA’s Fermi Gamma-ray Space Telescope in 2010, dark lightning is a surprisingly powerful — yet invisible — by-product of thunderstorms in Earth’s atmosphere. Like regular lightning, dark lightning is the result of a natural process of charged particles within storm clouds trying to cancel out opposing charges. Unlike normal lightning, though, dark lightning is invisible to our eyes and doesn’t radiate heat or light — instead, it releases bursts of gamma radiation. What’s more, these gamma-ray outbursts originate at relatively low altitudes well within the storm clouds themselves. This means that airplane pilots and passengers flying through thunderstorms may be getting exposed to gamma rays from dark lightning, which are energetic enough to pass through the hull of an aircraft… as well as anything or anyone inside it. To find out how such exposure to dark lightning could affect air travelers, the U.S. Naval Research Laboratory (NRL) is conducting computer modeling tests using their SoftWare for the Optimization of Radiation Detectors — SWORD, for short. 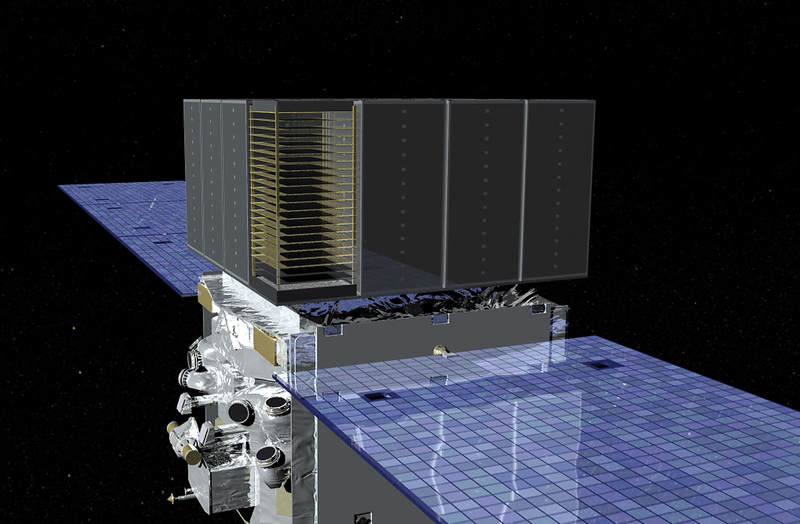 Terrestrial Gamma-ray Flashes (TGFs) are extremely intense, sub-millisecond bursts of gamma rays and particle beams of matter and anti-matter. First identified in 1994, they are associated with strong thunderstorms and lightning, although scientists do not fully understand the details of the relationship to lightning. The latest theoretical models of TGFs suggest that the particle accelerator that creates the gamma rays is located deep within the atmosphere, at altitudes between six and ten miles, inside thunderclouds and within reach of civilian and military aircraft. A team of NRL Space Science Division researchers, led by Dr. J. Eric Grove of the High Energy Space Environment (HESE) Branch, is studying the radiation environment in the vicinity of thunderstorms and dark lightning flashes. Using the Calorimeter built by NRL on NASA’s Fermi Gamma-ray Space Telescope they are measuring the energy content of dark lightning and, for the first time, using gamma rays to geolocate the flashes. As a next step, Dr. Chul Gwon of the HESE Branch is using NRL’s SoftWare for the Optimization of Radiation Detectors (SWORD) to create the first-ever simulations of a dark lightning flash striking a Boeing 737. He can calculate the radiation dosage to the passengers and crew from these Monte Carlo simulations. Previous estimates have indicated it could be as high as the equivalent of hundreds of chest X-rays, depending on the intensity of the flash and the distance to the source. Simulation of a Boeing 737 struck by dark lightning. Green tracks show the paths of gamma rays from the dark flash as they enter the aircraft from below. SWORD simulations allow researchers to study in detail the effects of variation in intensity, spectrum, and geometry of the flash. Dr. Grover’s team is now assembling detectors that will be flown on balloons and specialized aircraft into thunderstorms to measure the gamma ray flux in situ. The first balloon flights are scheduled to take place this summer. In a wave of media releases, the latest studies performed by NASA’s Fermi Gamma-ray Space Telescope are lighting up the world of particle astrophysics with the news of how supernovae could be the progenitor of cosmic rays. These subatomic particles are mainly protons, cruising along through space at nearly the speed of light. The rest are electrons and atomic nuclei. When they meet up with a magnetic field, their paths change like a bumper car in an amusement park – but there’s nothing amusing about not knowing their origins. Now, four years of hard work done by scientists at the Kavli Institute for Particle Astrophysics and Cosmology at the Department of Energy’s (DOE) SLAC National Accelerator Laboratory has paid off. There is evidence of how cosmic rays are born. Until now, scientists weren’t clear on some particulars – such as what atomic particles could be responsible for the emissions from interstellar gas. To aid their research, they took a very close look at a pair of gamma ray emitting supernova remnants – known as IC 443 and W44. Why the discrepancy? In this case gamma rays share similar energies with cosmic ray protons and electrons. To set them apart, researchers have uncovered the neutral pion, the product of cosmic ray protons impacting normal protons. When this happens, the pion rapidly decays into a set of gamma rays, leaving a signature decline – one which provides proof in the form of protons. Created in a process known as Fermi Acceleration, the protons remain captive in the rapidly moving shock front of the supernova and aren’t affected by magnetic fields. Thanks to this property, the astronomers were able to trace them back directly to their source. Are they little speedsters? You betcha. Every time the particle passes across the shock front, it gains about 1% more speed – eventually enough to break free as cosmic ray. “Astronauts have documented that they actually see flashes of light associated with cosmic rays,” Funk noted. “It’s one of the reasons I admire their bravery – the environment out there is really quite tough.” The next step in this research, Funk added, is to understand the exact details of the acceleration mechanism and also the maximum energies to which supernova remnants can accelerate protons. Original Story Sources and Further Reading: Novel approach in hunt for cosmic particle accelerator, NASA’s Fermi Proves Supernova Remnants Produce Cosmic Rays, and Proof: Cosmic Rays Come from Exploding Stars. Astronomers using NASA’s Fermi Gamma-Ray Space Telescope have been looking for evidence of suspected types of dark matter particles within faint dwarf galaxies near the Milky Way — relatively “boring” galaxies that have little activity but are known to contain large amounts of dark matter. The results? These aren’t the particles we’re looking for. 80% of the material in the physical Universe is thought to be made of dark matter — matter that has mass and gravity but does not emit electromagnetic energy (and is thus invisible). Its gravitational effects can be seen, particularly in clouds surrounding galaxies where it is suspected to reside in large amounts. Dark matter can affect the motions of stars, galaxies and even entire clusters of galaxies… but when it all comes down to it, scientists still don’t really know exactly what dark matter is. Possible candidates for dark matter are subatomic particles called WIMPs (Weakly Interacting Massive Particles). WIMPs don’t absorb or emit light and don’t interact with other particles, but whenever they interact with each other they annihilate and emit gamma rays. If dark matter is composed of WIMPs, and the dwarf galaxies orbiting the Milky Way do contain large amounts of dark matter, then any gamma rays the WIMPs might emit could be detected by NASA’s Fermi Gamma-Ray Space Telescope. After all, that’s what Fermi does. Ten such galaxies — called dwarf spheroids — were observed by Fermi’s Large-Area Telescope (LAT) over a two-year period. The international team saw no gamma rays within the range expected from annihilating WIMPs were discovered, thus narrowing down the possibilities of what dark matter is. “In effect, the Fermi LAT analysis compresses the theoretical box where these particles can hide,” said Jennifer Siegal-Gaskins, a physicist at the California Institute of Technology in Pasadena and a member of the Fermi LAT Collaboration. So rather than a “failed experiment”, such non-detection means that for the first time researchers can be scientifically sure that WIMP candidates within a specific range of masses and interaction rates cannot be dark matter. A paper detailing the team’s results appeared in the Dec. 9, 2011, issue of Physical Review Letters. Read more on the Fermi mission page here. It scans the entire visible sky every three hours. Its job is to gather light – but not just any light. What’s visible to our eyes averages about 2 and 3 electron volts, but NASA’s Fermi Gamma-Ray Space Telescope is taking a deep look into a higher realm… the electromagnetic range. Here the energy doesn’t need a boost. It slams out gamma-rays with energies ranging from 20 million to more than 300 billion electron volts (GeV). After three years of space time, the Fermi Large Area Telescope (LAT) has produced its first census of these extreme energy sources. Over its current operating time, Fermi has continued to paint an ever-deepening portrait of the gamma-ray sky. Even with the huge amount of data which pours in over its 180 minute window, high energy events are not common. When it comes to sources above 10 GeV, even Fermi’s LAT detects only one source about three times a year. Just what exactly is out there which can produce such a powerful process? When it comes to gamma-rays, more than half of Fermi’s nearly 500 findings are active galaxies where matter falling into their central supermassive black holes produces intense jets spewing out at close to light speed. A small portion – around 10% – of the census belongs to sources within the Milky Way. These are pulsars, supernova debris and a handful of binary systems which house massive stars. What’s really interesting is the portion of totally unidentifiable sources that constitute about a third of the findings. They simply don’t have any spectroscopic counterparts and astronomers are hoping that these higher energy sources will give them new material to compare their findings against. New sources emerge and old sources fade as the LAT's view extends into higher energies. Credit: NASA/DOE/Fermi LAT Collaboration and A. Neronov et al. When it comes to light – obey the rules. Just as we understand that sources of infra-red light fade away when viewed in the ultra-violet, gamma-ray sources above 1 GeV can disappear without a trace when viewed at higher, or “harder,” energies. “One example is the well-known radio galaxy NGC 1275, which is a bright, isolated source below 10 GeV.” says the Fermi team. ” At higher energies it fades appreciably and another nearby source begins to appear. Above 100 GeV, NGC 1275 becomes undetectable by Fermi, while the new source, the radio galaxy IC 310, shines brightly.” The Fermi hard-source list is the product of an international team led by Pascal Fortin at the Ecole Polytechnique’s Laboratoire Leprince-Ringuet in Palaiseau, France, and David Paneque at the Max Planck Institute for Physics in Munich. The new Fermi census will be a unique source of comparative information to assist ground-based facilities called Atmospheric Cherenkov Telescopes. These sources have confirmed 130 gamma-ray sources with energies above 100 GeV. They include the Major Atmospheric Gamma Imaging Cherenkov telescope (MAGIC) on La Palma in the Canary Islands, the Very Energetic Radiation Imaging Telescope Array System (VERITAS) in Arizona, and the High Energy Stereoscopic System (H.E.S.S.) in Namibia. “Our catalog will have a significant impact on ground-based facilities’ work by pointing them to the most likely places to find gamma-ray sources emitting above 100 GeV,” Paneque said. But big ground-based telescopes have big limitations. In this case, their field of view is very constricted and they can’t operate during daylight hours, full Moon or bad weather. But don’t count them out. “As Fermi’s exposure constantly improves our view of hard sources, ground-based telescopes are becoming more sensitive to lower-energy gamma rays, allowing us to bridge these two energy regimes,” Fortin added. Original Story Source: NASA Fermi News Release. For Further Reading: Major Atmospheric Gamma Imaging Cherenkov telescope (MAGIC) on La Palma in the Canary Islands, Very Energetic Radiation Imaging Telescope Array System (VERITAS) in Arizona and High Energy Stereoscopic System (H.E.S.S.) in Namibia. For Further Images: Fermi Images. Situated about 4,500 light-years away in the constellation of Cygnus is a veritable star factory called Cygnus X… one estimated to have enough “raw materials” to create as many as two million suns. Caught in the womb are stellar clusters and OB associations. Of particular interest is one labeled Cygnus OB2 which is home to 65 of the hottest, largest and meanest O-type stars known – and close to 500 B members. The O boys blast out holes in the dust clouds in intense outflows, disrupting cosmic rays. Now, a study using data from NASA’s Fermi Gamma-ray Space Telescope is showing us this disturbance can be traced back to its source. Discovered some 60 years ago in radio frequencies, the Cygnus X region has long been of interest, but dust-veiled at optical wavelengths. By employing NASA’s Fermi Gamma-ray Space Telescope, scientists are now able to peer behind the obscuration and take a look at the heart through gamma ray observations. In regions of star formation like Cygnus X, subatomic particles are produced and these cosmic rays shoot across our galaxy at light speed. When they collide with interstellar gas, they scatter – making it impossible to trace them to their point of origin. However, this same collision produces a gamma ray source… one that can be detected and pinpointed. Because these star types aren’t very common, regions like Cygnus X become important star laboratories. Its intense outflows and huge amount of mass fills the prescription for study. Within its hollowed-out walls, stars reside in layers of thin, hot gas enveloped in ribbons of cool, dense gas. It is this specific area in which Fermi’s LAT instrumentation excels – detecting an incredible amount of gamma rays. “We are seeing young cosmic rays, with energies comparable to those produced by the most powerful particle accelerators on Earth. They have just started their galactic voyage, zig-zagging away from their accelerator and producing gamma rays when striking gas or starlight in the cavities,” said co-author Luigi Tibaldo, a physicist at Padova University and the Italian National Institute of Nuclear Physics. “These shockwaves stir the gas and twist and tangle the magnetic field in a cosmic-scale jacuzzi so the young cosmic rays, freshly ejected from their accelerators, remain trapped in this turmoil until they can leak into quieter interstellar regions, where they can stream more freely,” said co-author Isabelle Grenier, an astrophysicist at Paris Diderot University and the Atomic Energy Commission in Saclay, France. However, there’s more to the story. The Gamma Cygni supernova remnant is also nearby and may impact the findings as well. At this point, the Fermi team considers it may have created the initial “cocoon” which holds the cosmic rays in place, but they also concede the accelerated particles may have originated through multiple interactions with stellar winds. “Whether the particles further gain or lose energy inside this cocoon needs to be investigated, but its existence shows that cosmic-ray history is much more eventful than a random walk away from their sources,” Tibaldo added. Original Story Source: NASA Fermi News. A couple of years ago, the Payload for Antimatter Matter Exploration and Light-nuclei Astrophysics, PAMELA, sent us back some curious information… an overload of anti-matter in the Milky Way. Why does this member of the cosmic ray spectrum have interesting implications to the scientific community? It could mean the proof needed to confirm the existence of dark matter. By employing the Fermi Large Area Telescope, researchers with the Kavli Institute for Particle Astrophysics and Cosmology (KIPAC) at Stanford University were able to verify the results of PAMELA’s findings. What’s more, by being in the high energy end of the spectrum, these abundances seem to verify current thinking on dark matter behavior and how it might produce positrons. But there has been a glitch in what might have been a smooth solution. Current thinking has the positron signal dropping off when it reaches a specific level – a finding which wasn’t verified and led the researchers to feel the results were inconclusive. But the research just didn’t end there. The team consisting of Funk, Justin Vandenbroucke, a postdoc and Kavli Fellow and avli-supported graduate student Warit Mitthumsiri, came up with some creative solutions. While the Fermi Gamma-ray Space Telescope can’t distinguish between negatively charged electrons and positively charged positrons without a magnet – the group came up with their needs just a few hundred miles away. This illustration shows how the electron-positron sky appears to the Large Area Telescope. 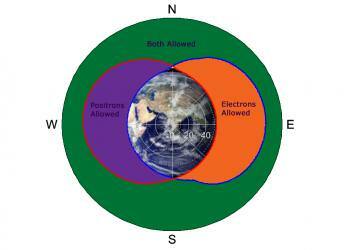 The purple region contains positrons while electrons are blocked by the Earth's bulk, the orange region contains electrons but is inaccessible to positrons, and the green region is completely out of the Earth's shadow for both positrons and electrons. Image courtesy Justin Vandenbroucke, Fermi-LAT collaboration. That’s right. Our very own planet is capable of bending the paths of these highly charged particles. Now it was time for the research team to start a study on geophysics maps and figure out precisely how the Earth was sifting out the previously detected particles. It was a new way of filtering findings, but could it work? Oddly enough, they still came up with more than the expected amount of antimatter positrons as previously reported in Nature. But again, the findings didn’t show the theoretical drop-off that was to be expected if dark matter were involved. Despite these inconclusive results, it’s still a unique way of looking at difficult studies and making the most of what’s at hand. Original Story Source: Kavli Foundation News Release. For Further Reading: Measurement of separate cosmic-ray electron and positron spectra with the Fermi Large Area Telescope. The famous Crab Nebula supernova remnant has erupted in an enormous flare five times more powerful than any flare previously seen from the object. On April 12, NASA’s Fermi Gamma-ray Space Telescope first detected the outburst, which lasted six days. Several other satellites also made observations, which has astonished astronomers by revealing unexpected changes in X-ray emission the Crab, once thought to be the steadiest high-energy source in the sky. The nebula is the wreckage of an exploded star that emitted light which reached Earth in the year 1054. It is located 6,500 light-years away in the constellation Taurus. At the heart of an expanding gas cloud lies what is left of the original star’s core, a superdense neutron star that spins 30 times a second. With each rotation, the star swings intense beams of radiation toward Earth, creating the pulsed emission characteristic of spinning neutron stars (also known as pulsars). Apart from these pulses, astrophysicists believed the Crab Nebula was a virtually constant source of high-energy radiation. But in January, scientists associated with several orbiting observatories, including NASA’s Fermi, Swift and Rossi X-ray Timing Explorer, reported long-term brightness changes at X-ray energies. “The Crab Nebula hosts high-energy variability that we’re only now fully appreciating,” said Rolf Buehler, a member of the Fermi Large Area Telescope (LAT) team at the Kavli Institute for Particle Astrophysics and Cosmology, a facility jointly located at the Department of Energy’s SLAC National Accelerator Laboratory and Stanford University. Since 2009, Fermi and the Italian Space Agency’s AGILE satellite have detected several short-lived gamma-ray flares at energies greater than 100 million electron volts (eV) — hundreds of times higher than the nebula’s observed X-ray variations. For comparison, visible light has energies between 2 and 3 eV. On April 12, Fermi’s LAT, and later AGILE, detected a flare that grew about 30 times more energetic than the nebula’s normal gamma-ray output and about five times more powerful than previous outbursts. On April 16, an even brighter flare erupted, but within a couple of days, the unusual activity completely faded out. The Crab’s high-energy emissions are thought to be the result of physical processes that tap into the neutron star’s rapid spin. Theorists generally agree the flares must arise within about one-third of a light-year from the neutron star, but efforts to locate them more precisely have proven unsuccessful so far. Since September 2010, NASA’s Chandra X-ray Observatory routinely has monitored the nebula in an effort to identify X-ray emission associated with the outbursts. When Fermi scientists alerted astronomers to the onset of a new flare, Martin Weisskopf and Allyn Tennant at NASA’s Marshall Space Flight Center in Huntsville, Ala., triggered a set of pre-planned observations using Chandra. It was also observed by NASA’s Rossi X-Ray Timing Explorer (RXTE) and Swift satellites and the European Space Agency’s International Gamma-Ray Astrophysics Laboratory (INTEGRAL). The results confirm a real intensity decline of about 7 percent at energies between 15,000 to 50,000 eV over two years. They also show that the Crab has brightened and faded by as much as 3.5 percent a year since 1999. Scientists think the flares occur as the intense magnetic field near the pulsar undergoes sudden restructuring. Such changes can accelerate particles like electrons to velocities near the speed of light. As these high-speed electrons interact with the magnetic field, they emit gamma rays. To account for the observed emission, scientists say the electrons must have energies 100 times greater than can be achieved in any particle accelerator on Earth. This makes them the highest-energy electrons known to be associated with any galactic source. Based on the rise and fall of gamma rays during the April outbursts, scientists estimate that the size of the emitting region must be comparable in size to the solar system. The Fermi Telescope is seeing a Universe ablaze with Gamma Rays! A new map combining nearly three months of data from the Fermi Gamma-ray Space Telescope is giving astronomers an unprecedented look at the high-energy cosmos. The sources of these gamma rays come from within our solar system to galaxies billions of light-years away. To show the variety of the objects the LAT is seeing, the Fermi team created a “top ten” list comprising five sources within the Milky Way and five beyond our galaxy. The Sun. Now near the minimum of its activity cycle, the sun would not be a particularly notable source except for one thing: It’s the only one that moves across the sky. The sun’s annual motion against the background sky is a reflection of Earth’s orbit around the sun. “The gamma rays Fermi now sees from the sun actually come from high-speed particles colliding with the sun’s gas and light,” Thompson notes. “The sun is only a gamma-ray source when there’s a solar flare.” During the next few years, as solar activity increases, scientists expect the sun to produce growing numbers of high-energy flares, and no other instrument will be able to observe them in the LAT’s energy range. LSI +61 303. This is a high-mass X-ray binary located 6,500 light-years away in Cassiopeia. This unusual system contains a hot B-type star and a neutron star and produces radio outbursts that recur every 26.5 days. Astronomers cannot yet account for the energy that powers these emissions. PSR J1836+5925. This is a pulsar — a type of spinning neutron star that emits beams of radiation — located in the constellation Draco. It’s one of the new breed of pulsars discovered by Fermi that pulse only in gamma rays. 47 Tucanae. Also known as NGC 104, this is a sphere of ancient stars called a globular cluster. It lies 15,000 light-years away in the southern constellation Tucana. Unidentified. 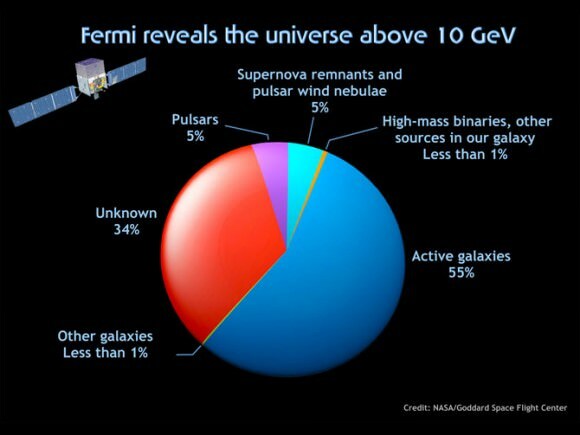 More than 30 of the brightest gamma-ray sources Fermi sees have no obvious counterparts at other wavelengths. This one, designated 0FGL J1813.5-1248, was not seen by previous missions, and Fermi’s LAT sees it as variable. The source lies near the plane of the Milky Way in the constellation Serpens Cauda. As a result, it’s likely within our galaxy — but right now, astronomers don’t know much more than that. NGC 1275. Also known as Perseus A, this galaxy at the heart of the Perseus Galaxy Cluster is known for its intense radio emissions. It lies 233 million light-years away. 3C 454.3. This is a type of active galaxy called a “blazar.” Like many active galaxies, a blazar emits oppositely directed jets of particles traveling near the speed of light as matter falls into a central supermassive black hole. For blazars, the galaxy happens to be oriented so that one jet is aimed right at us. Over the time period represented in this image, 3C 454.3 was the brightest blazar in the gamma-ray sky. It flares and fades, but for Fermi it’s never out of sight. The galaxy lies 7.2 billion light-years away in the constellation Pegasus. PKS 1502+106. This blazar is located 10.1 billion light-years away in the constellation Boötes. It appeared suddenly, briefly outshone 3C 454.3, and then faded away. PKS 0727-115. This object’s location in the plane of the Milky Way would lead one to expect that it’s a member of our galaxy, but it isn’t. Astronomers believe this source is a type of active galaxy called a quasar. It’s located 9.6 billion light-years away in the constellation Puppis. Unidentified. This source, located in the southern constellation Columba, is designated 0FGL J0614.3-3330 and probably lies outside the Milky Way. “It was seen by the EGRET instrument on NASA’s earlier Compton Gamma Ray Observatory, which operated throughout the 1990s, but the nature of this source remains a mystery,” Thompson says. The LAT scans the entire sky every three hours when operating in survey mode, which is occupying most of the telescope’s observing time during Fermi’s first year of operations. These snapshots let scientists monitor rapidly changing sources. The all-sky image released today shows us how the cosmos would look if our eyes could detect radiation 150 million times more energetic than visible light. The view merges LAT observations spanning 87 days, from August 4 to October 30, 2008.